I am Co-Director of the OpenLab, an open digital platform for teaching, learning, and collaborating. The OpenLab was launched in Fall 2011 by New York City College of Technology, CUNY (City Tech), a public, urban, commuter institution located in downtown Brooklyn. Built using open-source software (WordPress / BuddyPress), the OpenLab provides an academic social network where students, faculty, and staff connect, create profiles and portfolios, and collaborate in courses, projects, and clubs. Part of a U.S. Department of Education Title-V grant espousing hands-on, active learning to revitalize general education at a college of technology, the OpenLab is a laboratory for networked, open collaboration and multimodal composing. By bringing their work into the open, the OpenLab’s 28,000+ members move teaching, learning, and scholarship beyond the walls of the college while strengthening the intellectual and social life of City Tech. The OpenLab’s design and ease of use enable students and faculty to connect their work across multiple classes, bridge disciplinary boundaries, experiment with innovative tools and pedagogies, and engage real-world contexts, skills, and audiences and digital platform for teaching, learning, and collaborating at the college. While many scholars have advocated for students to write in public, rarely are there systematic, institutionalized opportunities for doing so. The OpenLab is an exception, attracting over 24,000 members (the majority of whom are students) and challenging a siloed academic experience by creating virtual community at an urban commuter campus and making visible connections across disciplines and courses. The OpenLab also exists as a vast, diverse corpus of networked, public, multimodal writing. 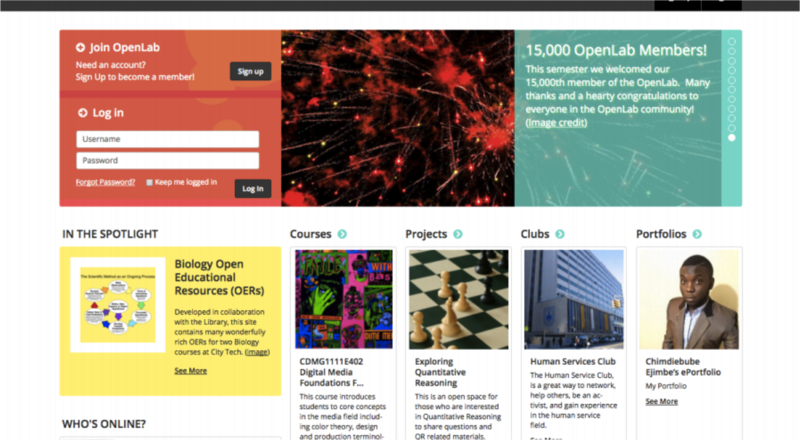 Currently, there are over 1,900 courses on the OpenLab, including hundreds of first-year writing courses, collaborative sites for first-year learning communities and interdisciplinary courses, as well as student clubs, research projects, Open Educational Resources (OERs), and over 5,800 student ePortoflios. The OpenLab was recently publicly released (in Fall 2018) via a grant-funded digital humanities partnership, so any institution is now able to leverage its possibilities for community-building, open digital pedagogies, and academic and public composing. Learn more about Commons in a Box OpenLab! I am a founding member / developer of the Writing Studies Tree (WST), a crowdsourced, online, open-access, interactive database of individual scholars, educational institutions, and the disciplinary movements that connect them. The WST offers an “academic genealogy” for the field of writing studies and related disciplines that serves as a model for visualizing the social history of humanities disciplines. Through a fixed data structure that gives open editing privileges to thousands of members, the site aggregates, visualizes, and recombines data, enabling us to discover large-scale patterns and movements, and thus to map the collaborative interpersonal paths by which a discipline emerges and matures. The WST, built in Drupal 7, has a database that currently contains roughly 1,750 people, 500 institutions, and 4,500 relationships, all navigable by browsing, searching, or filtering a graph of the full network. As of now, users can search and view the WST data through three distinct visualizations: the Individual View, the Family Tree View, and the Full Network View. Users can also add labels through two open taxonomies, allowing navigation by areas of interest or by affiliation with professional organizations. In a significant shift from prior academic genealogies, the WST also provides space for both open-ended narrative contributions and a data structure of nodes and relations, so as to build navigable paths that follow the interpersonal and inter-institutional relationships. Check out my co-authored article “The Roots of an Academic Genealogy: Composing the Writing Studies Tree” in Kairos: A Journal of Rhetoric, Technology, and Pedagogy (co-authors: Benjamin Miller, University of Pittsburgh and Amanda Licastro, Stevenson University) to learn more about the project. If you’re in the field, add yourself, your institutions, and your relationships and help grow the Tree! As the web developer for the North American Society for Utopian Studies, I have reconceptualized and redesigned this professional organization’s web presence. I created an interactive, collaborative digital space for the Society, built on the open-source software WordPress / BuddyPress (the same software that powers City Tech’s OpenLab: see above) that serves both as an archive and resource for utopian scholarship and pedagogical materials, and as a crucial networking tool for scholars in the field. This digital presence also involves websites for the Society’s annual conferences (some of which are powered by Open Conference Systems); the Society newsletter, Utopus Discovered; Teaching Utopia (a site that aggregates/discusses utopian syllabi/assignments), a utopian bibliography; and activity on social media (Facebook and Twitter).